Her invention won an award at the sixth International Congress of Paediatric Nursing. A nurse has designed a hug simulator that mimics comforting parental arms for newborn babies when separated from their parents. Maria Dolores Hernandez, who works at Casa Salud hospital in Valencia on the east coast of Spain, calls her invention “Amb Tu”, which means “with you”. The prototype features an artificial cosy pair of arms perfectly shaped to wrap around a newborn in comforting. Also incorporated are an electronic heartbeat, relaxing music, and a recorded human voice so the child can believe the parent is really there. Monitoring equipment to measure the baby's breathing and heartbeat are included. Maria's invention has already been successfully tested in the premature baby unit of Casa Salud. Doctors reported that babies appeared to be more comfortable and were crying less often since its introduction. Maria said her aim was to simulate the "hug that comforts", which has "therapeutic power for the body and soul". 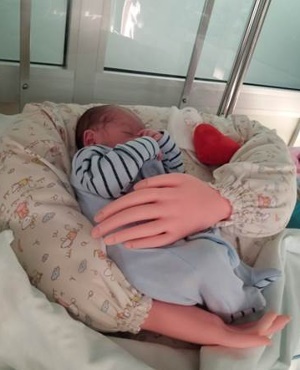 "The idea is to create a kind of pillow simulating the human body, with arms, to keep the baby warm and sound." The nurse said she hoped Amb Tu would reduce stress in newborn babies, making them feel secure and protected even when their parents couldn’t be with them.